Cherrybrook Kitchen is a privately held company producing baking products for the food allergy market. The company was founded in 2004 by Patsy Rosenberg, who developed food allergies in 2000 and learned how to eat and cook without dairy, egg or nuts. This is Chocolate Chip Muffin Mix and peanut, dairy, nut or egg free. Things I need to add was melted margarine (or dairy-free oil) and rice milk. I'm sure you can use real milk too if you're not lactose intolerant. While mixing the muffin mix with margarine and rice milk, I preheated oven to 400F. The mix didn't look like it had chocolate chips in at first, but there're a lot in it. 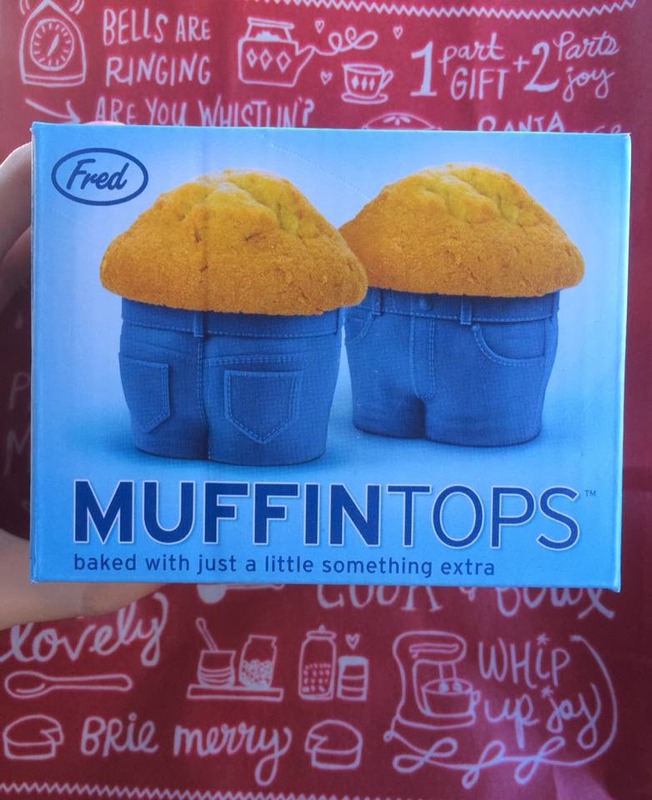 The muffin cups I used were called "Muffintops" and it's needless to say coming from "muffin top," flabby flesh on the jeans, especially low-rise. Following the direction on the Muffintops, I put margarine inside of the jeans-shaped mold. For first batch, I put margarine to the waste line too so that the muffin might come out easily. Ready to go into oven! I baked them for 12 minutes as the box said, but they weren't brown yet so I put another 5 minutes and they're ready. They didn't have enough muffin top around the waist, and the muffins were kind of rising up straight. Maybe it because I put margarine on the waist line. After letting them sit for 2~3 minutes, I squeezed lightly the back pockets and zipper area so loosen the muffin to take out. As you can see, when you take out the muffin from the cup, it'd sink for a little bit and become shorter. The top was crispy and shiny, and the bottom part was very moist and soft with a lot of chocolate chips in. For the second batch, I didn't put margarine over the waist to see if that would help the muffin dough would stay and create muffin top. And I set the timer to 18 minutes this time. Second batch turned out better and more muffin tops! I've never get so excited to see muffin top but this is looking soooo good. With the Muffintops cups, I made 11 cupcakes, instead of 12. All the muffin looked and and I tried one of them, and it's very tasty. Top was crispy like a cookie, bottom was moist, and chocolate chips were crunchy. Easy, not much to prepare, and turned out great. I'd love to buy this mix again. Without Muffintops cups, the muffins look like mushrooms. For the Muffintops cup, the best way to have muffin top is not putting margarine over the waist line and maybe pour muffin dough slightly more than the line inside.